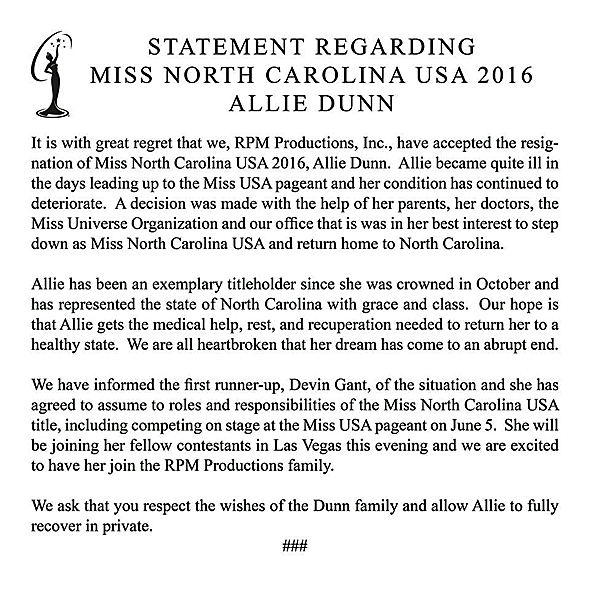 RPM Productions, the franchise owner of Miss North Carolina USA, has released a statement today announcing that Miss North Carolina USA 2016, Allie Dunn, will be unable to compete in Miss USA 2016 pageant in Las Vegas on June 5 due to illness. Dunn has resigned from her position and has been replaced by her first runner-up, Devin Gant. We wish Allie a full recovery and we wish Devin the best of luck in Miss USA 2016.